Anand Prakash is a stationery and gifting store that has unique, India-inspired products like handloom khadi bound journals, lacquered bookmarks, religious tea light holders and so much more. Every year, with the festive time of the year coming up, most of us scratch our heads to find the perfect gifts–the search, usually, ends up in settling for the cliched. We found Anand Prakash, a stationery and gifting store, that's quite a step up from the usual. 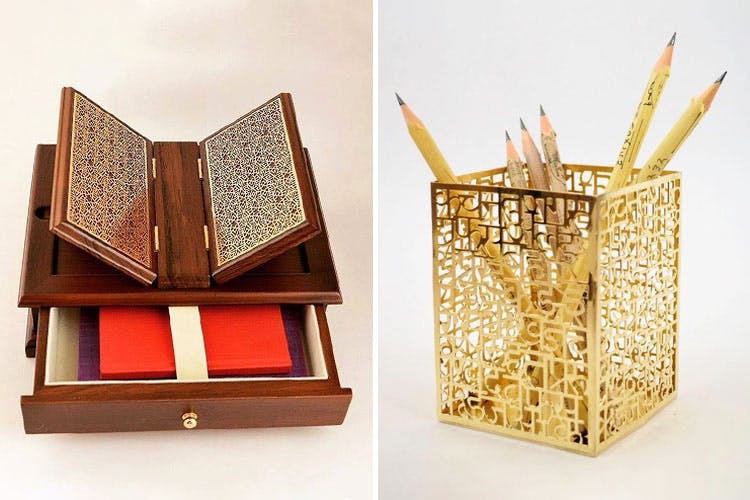 They've got journals, notebooks, home decor, souvenirs and even jewellery–except it's all handmade in India and all inspired by the Indian aesthetic. Snag a handwoven silk journal, a jute-bound one, a vintage printed notebook or anything awesome from this extremely varied section–we specially love the khadi journals. There's also a lot of religion-inspired stuff like Ganesha tea light holders, Buddha bookmarks, and more. In the stationery section, you'll find notecards and envelopes with gold prints like elephants, bicycles, airplanes and others. You can even do up your home with their decor section where you'll find door hangings, wall clocks, photo frames and more. You can only return a product you buy from here only if there are genuine quality and damage issues. Since they are handcrafted products, a return won't be possible if there's no acceptable reason or just because you don't end up liking it. They've got a special Diwali section on their website where they've listed their best festive products in one place–it's easier to go through than the whole website.